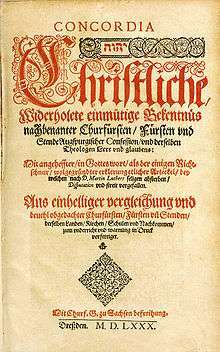 Luther's Small Catechism (Der Kleine Katechismus) was written by Martin Luther and published in 1529 for the training of children. Luther's Small Catechism reviews the Ten Commandments, the Apostles' Creed, the Lord's Prayer, the Sacrament of Holy Baptism, the Office of the Keys and Confession and the Sacrament of the Eucharist. It is included in the Book of Concord as an authoritative statement of what Lutherans believe. 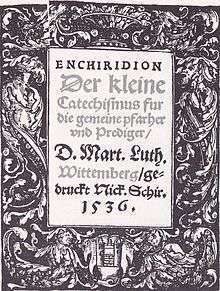 The Small Catechism is widely used today in Lutheran churches as part of youth education and Confirmation.